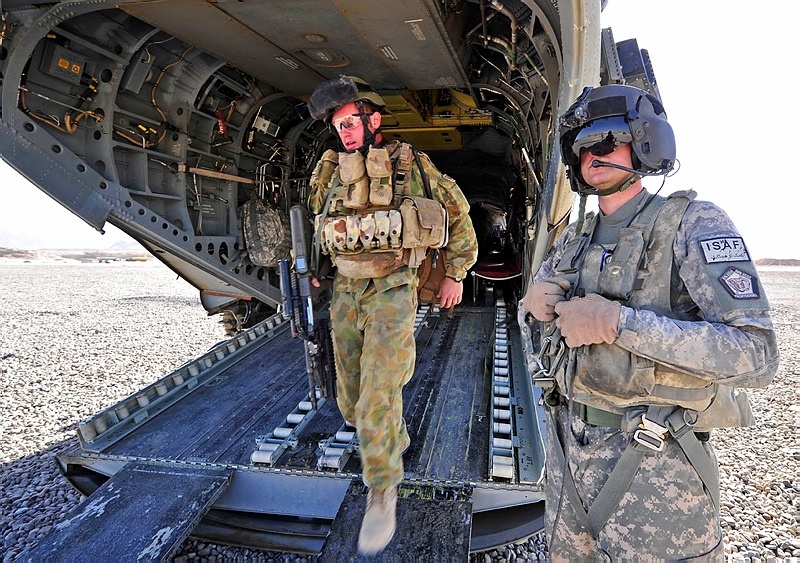 Cooperation and military interoperability come easily to the United States and Australia. The extraordinary level attained reflects our compatible national attitudes and common traits of confidence, ingenuity, optimism and initiative. Interoperability is too frequently associated with common systems and shared acquisitions, but important opportunities exist elsewhere and that is my focus here. Adjustments to the US defence budget will not cause the US to be displaced as the dominant global military power, and even as the US grapples with its fiscal future and the US Department of Defense adjusts to a period of austerity, the Asia–Pacific region will remain the priority. There is no question each country must engage in other important bilateral and regional relationships, but our common regional priority, unmatched commitment to military jointness and a keen awareness of the changes and opportunities of an expanding information environment can underpin even closer cooperation. We should start with resetting the governance model of military cooperation and interoperability. Coordination can be improved if we better integrate initiatives among the strategic, operational and acquisition domains. While coordination is good, it remains stove-piped by domain. Bringing the leaders of those domains together will enable better benchmarking and results at every level of coordination. Assumptions and objectives can be discussed, coordinated, reset where needed and synchronised. As in all endeavours, people are key. There must be more flexibility in how we embed military personnel into each other’s forces. The current exchange model is too rigid, and we must move away from a one-for-one exchange to a process that allows for more cross assignments without mandatory exchange and set periods of assignment. Cross assignments in the ground force should be a priority to ensure we do not miss the opportunities to share the lessons observed from our recent campaigns in Iraq and Afghanistan. We should take advantage of commonality in aircraft squadrons such as P-3, F/A-18, EF-18, SH-60R and soon P-8 and Joint Strike Fighter. Australian acquisition of AEGIS and amphibious ships open opportunities as well. Intelligence specialists, cyber personnel and foreign area specialists can also benefit from a more flexible and aggressive cross assignment scheme. Technology is enabling more expansive and effective maritime domain awareness capabilities. The introduction of unmanned, broad area surveillance systems can deliver key information that is useful beyond military applications and common ground stations and operating sites can serve both countries well. To enhance cooperation and expand interoperability of the above, combined centers of excellence (COE) should be established to capture the technical and operational advances that will come. COEs in anti-submarine warfare, amphibious warfare, air defence, cyber and special operations should be priorities. COEs staffed by men and women from both militaries, industry; and, where appropriate, academia will provide a rich intellectual environment to advance thinking and cooperation. Robust modeling and simulation and distributed training networks will add to the richness of the activity and serve as a vehicle to ensure enduring network compatibility. Our unmatched level of shared jointness makes possible a combined virtual headquarters, similar to a model used by the US Pacific Command. Such a headquarters could be staffed by both militaries and designed to accommodate other nations should circumstances require. Such a structure would have personnel assigned and prepared to move and form on short notice to respond to natural disasters or other events. Training and qualification could be conducted virtually in each country at locations where the personnel are assigned in their national capacity. Maintenance agreements and facilities should be examined for increased cooperation and prepositioned training and contingency equipment sets procured and located at appropriate training sites to facilitate training in both countries. While there is an upfront cost, the expense and operational efficiency gained over the long term will be well worth the investment. The US–Australia alliance is strong and proven, but the times, technology and opportunities are new. It’s time to think anew, take a long view and raise the interoperability bar even higher. Gary Roughead is a retired US Navy Admiral and former chief of naval operations, US Navy. He is currently an Annenberg Distinguished Visiting Fellow at the Hoover Institution, Stanford University. Image courtesy of Department of Defence.